The research project focuses on modeling the behavior of bicyclists at intersections under complex traffic situations and interactions with motor vehicle traffic. Bicycling is an important part of the urban transport system and traffic control measures are necessary to control traffic flow. The capacity and traffic quality of all traffic participants at signalized intersections can be highly influenced depending on the volume of bicycles. 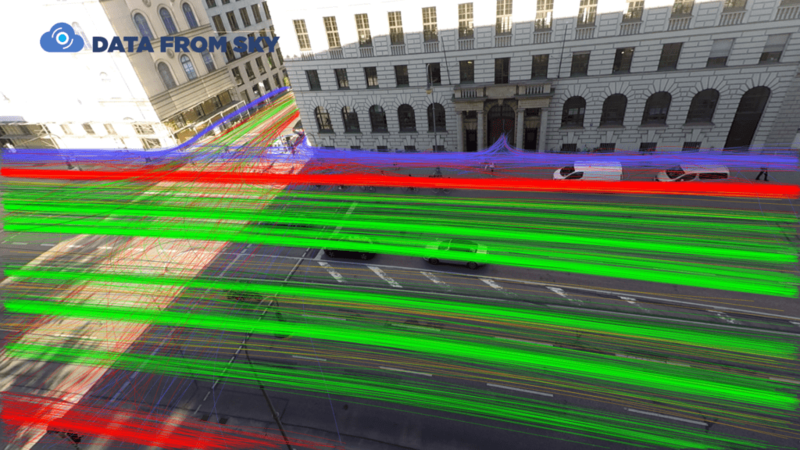 Video data for this project were collected by setting up high definition cameras on the top of the buildings (to obtain suitable aerial view for the DataFromSky Aerial analysis) near several intersections in the cities of Munich and Freiburg in Germany. Explicit and implicit behavior patterns of cyclists at intersections in the video are observed. Explicit behaviors include bicyclists’ body language to reveal their intentions like hand gestures or head movement. Implicit behaviors such as speed change, view change, or path change, indicate the lateral movement of cyclists indirectly. As for lane changing behavior and driving features, such as speed and positions, extracted by DataFromSky, the cyclist’s path selection behavior at intersections is analytically described. The analyzed video data results in a model that predicts the behavior of cyclists at intersections based on their explicit and implicit behavior patterns in specific traffic situations. The resulting model can be used for example for supporting tactical and operational functions of automated vehicles in specific traffic situations or as an initial analysis that can give traffic and urban planners a very good overview for proposing some traffic adjustments. This research project, with the use of DataFromSky, is being carried out by Technical University of Munich in Germany, Department of Civil, Geo and Environmental Engineering, lead by Dr. rer. nat. Andreas Keler, Dr.-Ing. Matthias Spangler, created by M.Sc. Georgios Grigoropoulos and Niu Ruixin. Every now and then, an unique and interesting use case for DataFromSky comes up. The Department of Transportation Planning and Engineering at National Technical University of Athens is planning to use DataFromSky for traffic monitoring – to study interactions between powered two-wheelers (PTW) and other vehicles. They have already published a number of papers, dealing with powered two-wheelers’ overtaking in context of game theory or modelling based on multivariate statistics . The smaller size of PTWs makes it possible to keep moving and overtaking even in conditions where cars are immobilized. In some countries, PTWs are either a dominant form of traffic, or take up a large share. Given these facts, there is a lot of opportunities to build a better understanding of their interactions – and hopefully also safety in these situations. Below is a short video which we analyzed as a demonstration for the Greek scientists.